Bedol Water Clocks are quickly stealing the spotlight for their unique ability to run solely on H2O, helping to reduce our carbon footprint on the planet. Not only are these clocks environmentally friendly, they also come in a wide variety of shapes, sizes and colors to suit any style. In addition, the clocks are high quality and perfectly accurate. Each clock is beautifully designed and requires no batteries, chemicals or electricity to function. By simply filling these charming Eco-clocks with water, you can enjoy up to six months of hassle free time-telling! 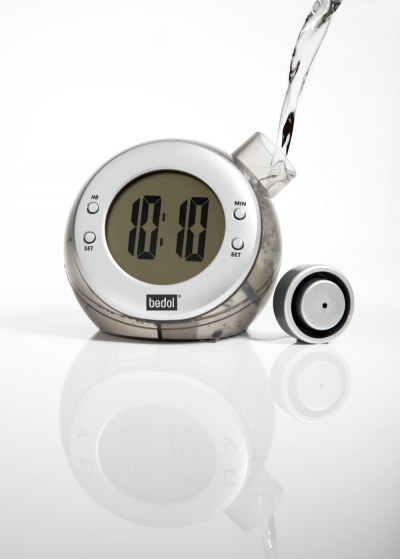 The Bedol water clocks have a built-in memory chip so that even while you are refilling the water in the clock, it is able to continue keeping time. Bedol Eco-friendly water powered clocks make a wonderful addition to any home or office and are an ideal gift for Eco-conscious consumers. The clocks are also equipped with alarms, which can be set to daily or hourly settings and have the option to read as either 12-hour or 24-hour increments. Bedol's bold collection is vast and innovative. The Wink Clock is available in blue, modern white, olive green, bright orange, shadow grey and fun raspberry, measuring 10" wide by 6" deep and 2.5" high. 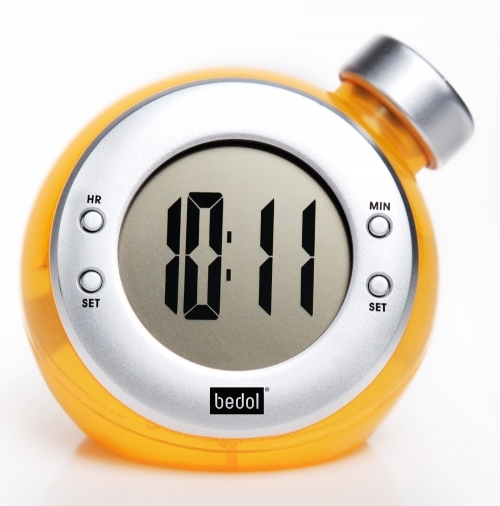 The Bedol Wink Clock is shaped to resemble a water drop that has splashed to the ground. The Smiley Clock is also available in six different colors and reflects the natural beauty and elegance of water, also taking its shape from a splashing water drop. This clock takes the ions that are in the water and converts them into clean powered energy. In keeping with its progressive innovative Eco-friendly designs, Bedol also offers a Wall Wave Clock in a seamless contemporary design that can be wall-mounted to show the exact time and date, and can even be set in a number of optional languages. The Wall Wave Clock is also capable of displaying the humidity and atmospheric pressure of the room. When it comes to Eco-friendly clocks, Bedol has merged beauty with brains, producing clocks that have a positive impact on the environment with lots of divine appeal and practical use. For more information, please visit Bedol online.